SeeClickFix released a Facebook application to encourage community participation and government accessibility in improving public spaces. Image via SeeClickFix. SeeClickFix, an online forum created to engage residents with community leaders to resolve neighborhood complaints, today announced the launch of a Facebook application. The Facebook application, similar to the SeeClickFix website and smartphone application, empowers citizens by giving them a chance to report issues in their communities directly through their Facebook accounts. Once reported, local authorities receive alerts on the complaints and can respond to issues accordingly. The most significant advantage to the Facebook application is the ability to broadcast issues to groups of friends, family and colleagues, and garner support from an already established network. SeeClickFix has 14,000 registered public officials and more than 50,000 reported issues have been resolved through the website and its mobile application’s open forums. A Facebook application further encourages public empowerment by linking citizens with public officials through a familiar interface. 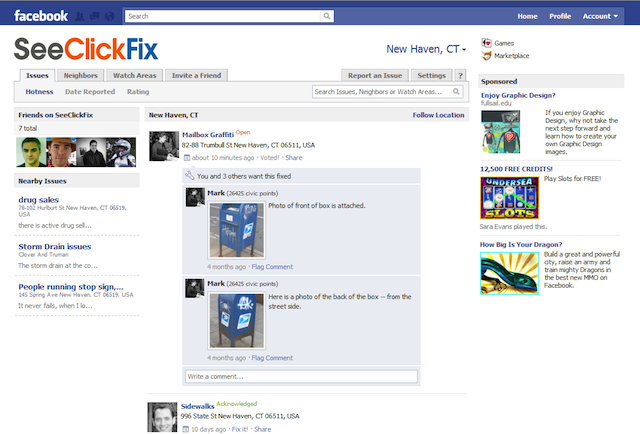 Upon having witnessed Facebook’s role in empowering citizens during the recent uprisings in the Middle East, as well as the popularity of games like FarmVille that allows players to modify their virtual neighborhoods, SeeClickFix CEO Ben Berkowitz recognizes the application as a powerful opportunity to increase community involvement. “We are excited to see how Facebook users make real-life, offline changes to their communities through our application,” Berkowitz says. Government and media partners can also incorporate the application as a tab on their official Facebook pages, further encouraging accessibility, the SeeClickFix blog continues. Available in more than 10 languages, the application is also accessible around the world in countries like Finland, Mongolia, Russia, France and Argentina. In fact, SeeClickFix.com is available in 83 languages and aims to have a global geographical reach. We recently reported on SeeClickFix’s integration with Open311API, an open-source communication technology centered on public space and public services. The collaboration of the two technologies is further assurance that reports filed through SeeClickFix will reach decision-makers. To learn more about SeeClickFix or to report an issue in your neighborhood, visit their website.